Tech Inspections are mandatory for anyone attending our Driver Education events, and strongly recommended for anyone planning to Autocross. 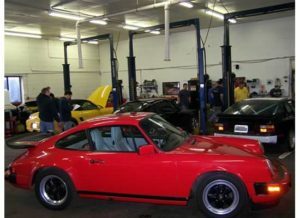 In addition, all Porsche owners are more than welcome to have their cars inspected. This is a terrific way to ensure your car is ready for the driving season. At a tech inspection your car will be put on a lift, wheels will be removed, and a general check-up of your cars road and/or track worthiness will be performed. Some of the items checked are suspension components, safety systems, belts and hoses, fluids, bearings, brakes, tires and wheels, and exhaust system. Links to the actual Tech Inspection form, and the Rules & Regulations, can be found on the Driver Education page of the Niagara PCA website. Tech Inspections are first come first served, so arrive early. Drivers are expected to assist in removing and replacing their own wheels, so please dress appropriately. Of course, there will be plenty of people on hand to assist. Anyone interested in helping at either of the Tech Inspections can contact Mike Zotter. Assistance is always greatly appreciated! MAP AND DIRECTIONS to Eksten Autoworks.